Four thousand pounds goes a long way in the world of sports motorcycles. Of course, we don’t expect everyone to agree with this list and we’d imagine there are a fair few who will get to the end and be dismayed by the absence of a bike they deem to be worthy of this list. Sports bikes make riders passionate like that, and at Devitt we both acknowledge and applaud that. But after careful deliberation and having trawled various websites to find the best deals both privately and through dealers, we’ve come up with 10 bikes that would have us reaching for our wallets in a heartbeat. One of the most revered sports bikes on the road today, the Suzuki GSX-R1000 K5 can still mix it with the best of the current crop. You might not get rider aids such as traction control or anti-locking brakes, but what you do get is a razor-sharp chassis and a torquey, relatively long-stroke motor with so much soul it makes James Brown look like a choirboy. 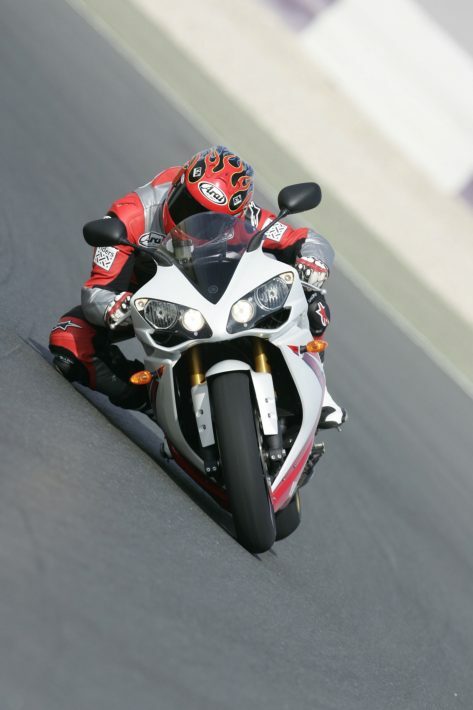 Handling was a step ahead of the game when it was launched in 2005 and it became an instant hit with both club and national racers alike, building on its original tagline ‘Own the Racetrack’. The K5 was, and still is, something just a little bit special. Arguably the bike that saved the British breed from extinction and unquestionably the most exciting thing to come out of the small Leicestershire town of Hinckley since… well, since ever. 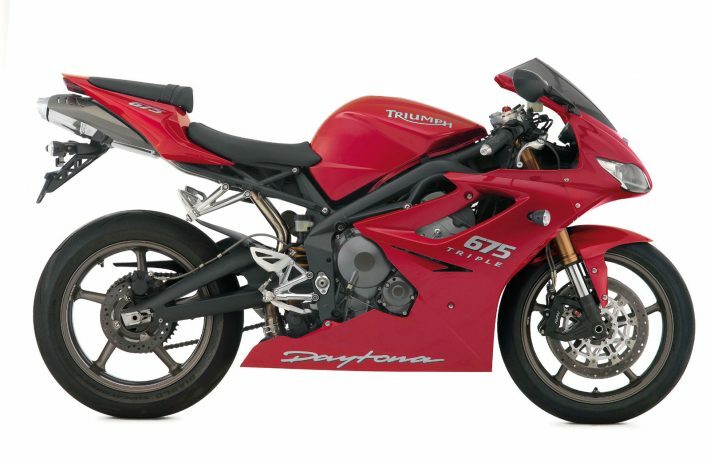 The Triumph Daytona 675 2007 original is a stunning motorcycle but the 2009 revision, while only minor, ironed out the debut machine’s few wrinkles and made a great bike even better. The inline three-cylinder motor has a sound and feel all of its own that truly offers the best of both worlds with the flexibility of a high-revving four with the low-down grunt of a twin. Handling is sublime, fast-steering without being nervous, and the narrow twin-spar chassis delivers the perfect riding position along with oodles of ground clearance. 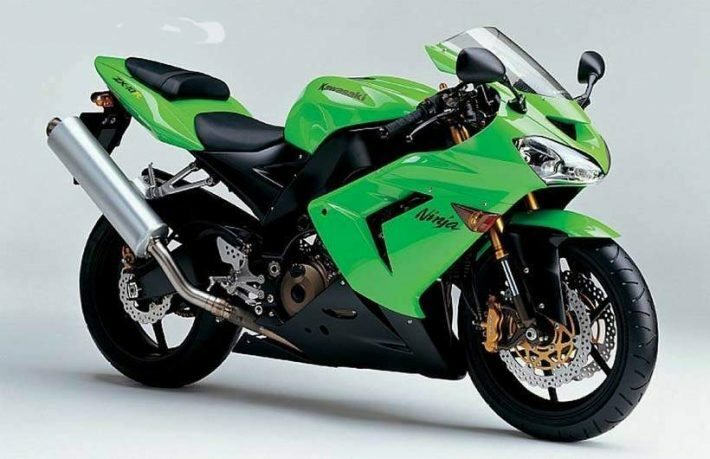 Perhaps the perfect sports bike for the vast majority of riders. What makes this bike so good is that it’s essentially a GSX-R600 with the perfect power upgrade — 149 more cubic centimetres — and with little in the way of extra weight it’s almost a street-legal Supersport racer. Purists will doubtless prefer the double blue and white colour scheme however the stealthy black paint job suits this bike’s angles to a tee. 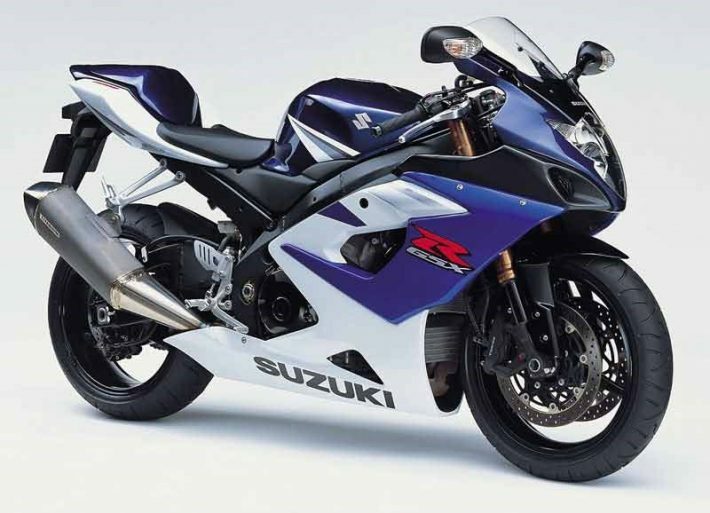 Handling is typical GSX-R — just the right side of flighty — while the motor spins up with a feeling of very little resistance all the way to its howling 12,000rpm redline. If you think a 600 is a bit too much like hard work and a 1000 is simply a bit too much, then here is your nirvana. Of course, you could opt for the earlier version if you want a better all-round road bike but there are few better handling bikes for the money than the mighty Yamaha R6. As track-focused as it gets, everything about this bike screams ‘racetrack’, especially the engine that, with its 18,000rpm redline, begs to be thrashed albeit at the cost of a little road-friendly midrange. A class leader when it was launched over 10 years ago with technical advances such as fly-by-wire throttle and both low and speed compression adjustment for both front and rear suspension, it’s still a very capable bike now — indeed up until the launch of the 2017 model, very little had changed. No, not the ballistic sofa from the late 80s, this version of the Kawasaki ZX-10 is as sharp as a scalpel and just as deadly in the wrong hands. Handling and braking are both excellent but only a brave man would ride one with any enthusiasm without the reassurance of a steering damper, so make sure one’s fitted or factor it into your budget. A torque-monster of a motor means this bike can — and will — lift its front wheel even in fourth gear over rises and crests, so a tempered (and experienced) right hand is essential. 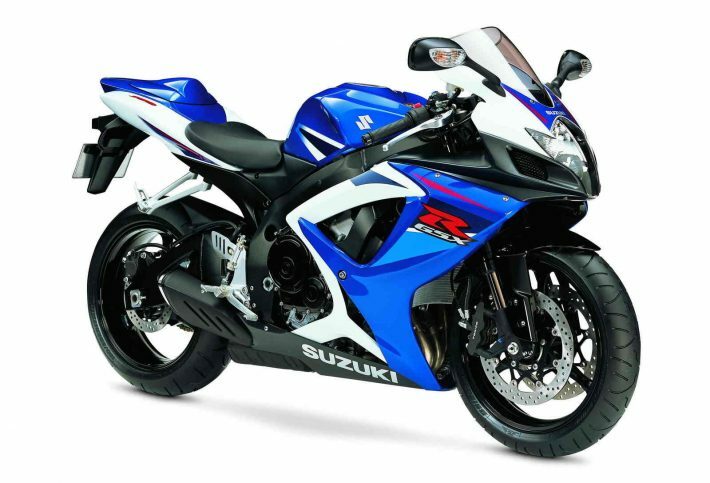 Not as easy to ride as the Suzuki GSX-R1000K5 or as civilized as either the R1 or the Fireblade. But then that’s what we love about it: in a health and safety-obsessed world, you can still buy something this bonkers crazy. 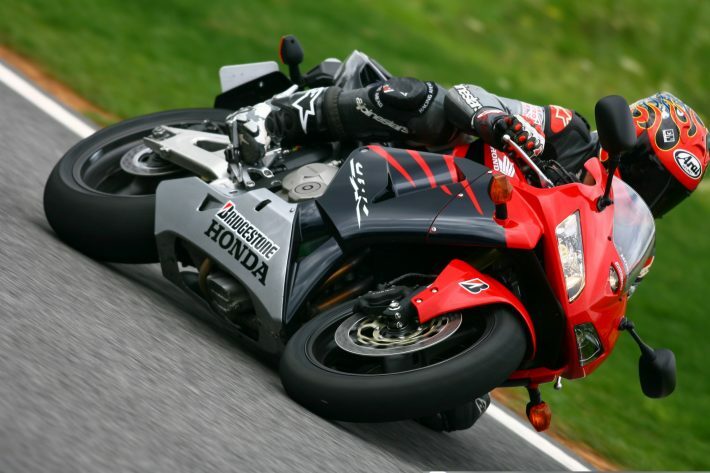 The arrival of the CBR600RR was big news and a massive step forward for the 600 class in 2003. Indeed it was such a big step forward that it immediately started winning just about every race series it was eligible for. Mass centralisation was Honda’s big thing at the time, and in achieving this Holy Grail of weight distribution it created a bike that was almost too easy to ride fast. 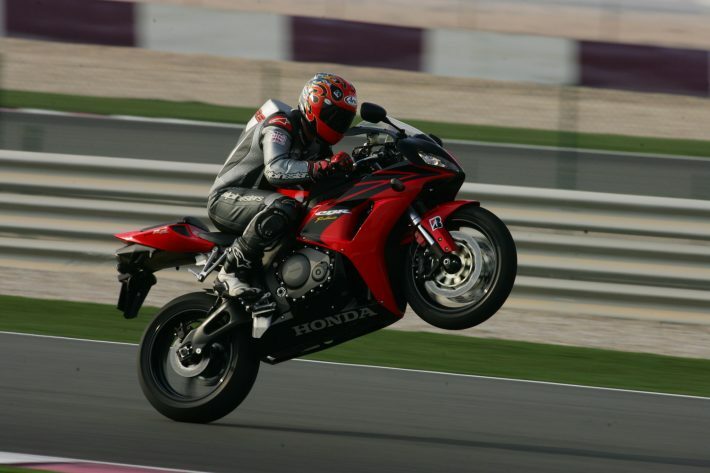 Honda made it even easier in 2005 by introducing stiffer inverted forks and radial brake calipers that offered far more feel and outright stopping power making this the version to go for. Easy handling, a willing, rev-happy motor and stunning RC211V MotoGP-inspired good looks, the CBR600RR is perhaps the easiest bike in this list to go fast on. 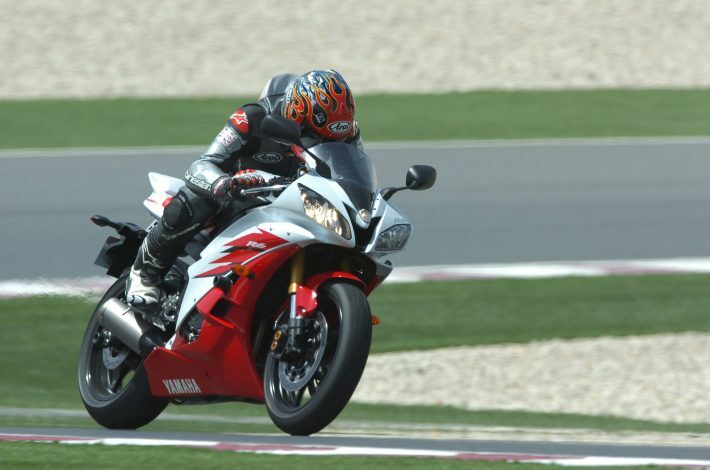 The fifth generation R1, and the second of the underseat-piped machines, the 2007 R1 is a real gem of a road bike. Handling was sharpened up considerably for the racetrack, thanks to a new frame and swinging arm but without making it to focused for the road. Brakes were improved too, although the sizable six-pot calipers are really no better than most modern four-pots. The motor was also breathed on, the most noticeable revision being a move back to four-valves per cylinder from the famous five-valve Genesis concept. The result was a more powerful, faster revving engine. Combined with great handling, this bike is a real £4k bargain. A massive revision of Honda’s legendary Fireblade, and the first to be created without the assistance of the original Fireblade’s father, Tadao Baba, the RR4/5 is without question one of the best-mannered used sports bikes available. Super-stable and incredibly neutral, thanks to the ethos of mass centralisation Honda first employed on the RC211v-inspired CBR600RR, the Fireblade is one of those bikes that takes very little getting used to, and seems to fit riders of all shapes and sizes. The powerful motor is pretty much linear with no vicious steps to catch out the unwary and the fuelling is nearly on a par with the super-smooth Yamaha though nowhere near as raw and natural as the Suzuki. If you’re after a ride-and-forget sports bike that has impeccable road manners, then this is it. 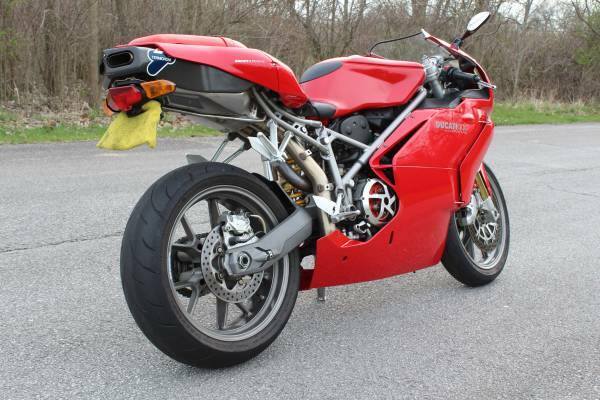 Considered the ugly duckling by many of the Ducatisti, and something that is reflected in used 999 prices with plenty of older, prettier 998s fetching far more money for examples in similar condition. So look at the 999 as a cheap way into the Ducati brand. Good enough to win a hatful of WSB and BSB titles, this is a fantastic motorcycle. The V-twin motor packs a decent punch and on track this machine is in its element, the steel-trellis frame and quality suspension (Öhlins if you can find an S model) combining to give oodles of feel and feedback while the Brembo brakes do a top job of keeping it all in check. The biggest downsides are the riding position feels awkward on slower roads and in traffic — and the mirrors are next to useless when you’re sat upright. It still amazes us how such an exotic bike can be so affordable. The Factory is the bells and whistles version of the RSV1000R and as such is loaded with designer labels. Much like the Ducati, the Aprilia can be a bit of a handful on the road and needs an experienced hand at the tiller. Also, in keeping with its Italian rival, its top quality suspension loves the racetrack and it’s here where it really comes alive. The big 60° V-twin motor delivers more grunt than a pig farmer’s lorry and the chassis is not only polished in looks but also by years of development in 250GPs. It’s a class act in the right hands on the right roads but if you’re after slightly more easygoing fun, then look higher up the list.